Preheat oven to 400° F. Line a baking sheet with aluminum foil. Set aside. Remove the ends of the Brussels sprouts and then slice in half. Transfer the halved sprouts to the baking sheet. 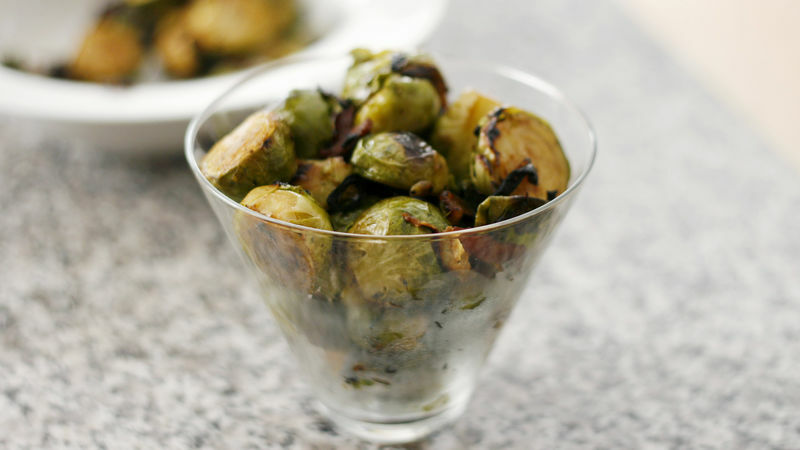 Spray the Brussels sprouts with olive oil spray and then sprinkle with salt and pepper. Slide the tray into the oven and bake for 15 minutes, stirring once. Meanwhile, heat a skillet over medium heat and add the bacon. Once the bacon is just about browned, remove it to a paper towel-lined plate. Add the shallots to the skillet and saute until they turn a rich golden brown. If the Brussels sprouts aren't done yet, remove the shallots from the pan with the slotted spoon as well. Once the Brussels sprouts are done, add to the skillet and sprinkle with the bacon and shallots. Toss well to combine. Sprinkle with salt and pepper to season, if desired. Serve. Serve with a sprinkling of freshly grated Parmesan cheese. Brussels sprouts have become quite popular in the food world, but I have been majorly lovin’ on them for years now. Heck, my first Brussels sprouts recipe was for them braised with bacon. It’s still one of my faves, but I have learned faster ways to make the fabulous little balls of green leafy goodness. So, for this recipe for Brussels Sprouts with Bacon and Shallots, I started from scratch. Although it uses similar flavors as my original recipe, the cook time has been cut way down and the results are super tasty – in a new way. Basically, it’s fast, easy and absolutely delicious. Start with fresh Brussels sprouts. And yes, they need to be fresh. I just haven’t been able to duplicate the deliciousness of roasted Brussels sprouts using frozen ones. Anyway, roast them with a spritz of olive oil and a sprinkling of salt and pepper. Meanwhile, brown up two chopped slices of bacon, and then two shallots. Once the sprouts are done roasting, toss them with the bacon and shallots in the bacon drippings, which cooks them a little more and allows that fabulous bacon flavor to really permeate them. But since it was just two slices of bacon, you really aren’t going hog-wild with the fat and calories either. It’s a win-win for flavor and keeping it on the more waist-friendly side.